So you love that coastal living decor but you live in a dark apartment. By dark, I mean you don't have the luxury of natural light flooding into your apartment through tall wide open windows. Perhaps the rooms are broken up into small rooms and not the wonderful open space found in late built and luxury apartments. It's not entirely impossible to achieve. You can tastefully inject elements found in coastal apartment lifestyles. It's important to understand that there are some differences in coastal decors found on the East Coast, the Southern Coasts and the West Coast. 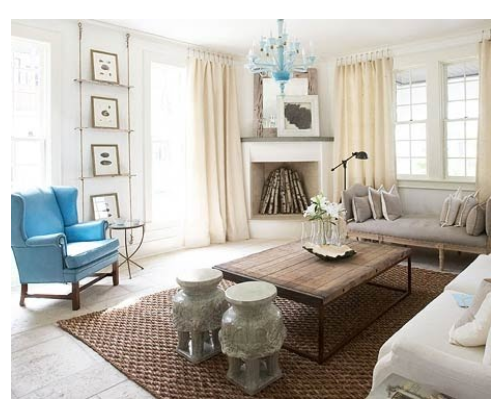 I'll lay out some of these differences as we look at 13 classic examples of coastal decors. NOTE: Much of what is written here is based on decors in single family homes. But don't be intimidated or scared off because you live in an apartment or a really tiny space, such as a tiny home. Simply look for key elements from which you can select: colors, a key piece of furniture, and accessories and art. 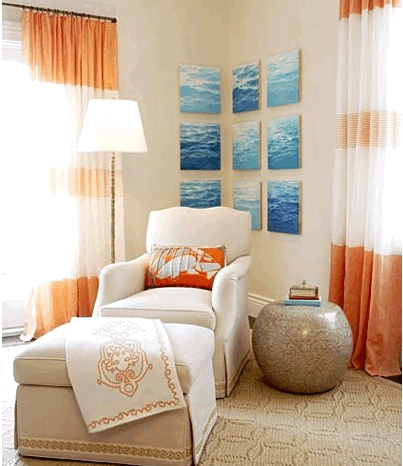 As illustrated in the first image above, coastal decors tend to be a little refined. Colors are darker and richer which counters those cold, dark winter months. Older apartment buildings have smaller windows that are framed with moldings and window ledges. The frames are often painted a contrasted color. Also, to be found in older apartment buildings are decorative moldings, such as chair rails and sometimes chandelier medalions. These detailed elements are stylistic holdovers from the colonial and Williamsburg periods. So how do you bring in coastal elements? 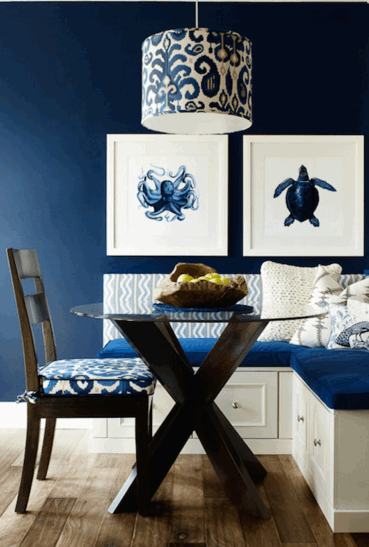 When the rooms are broken up into smaller rooms, select deep colors found in the oceans or on the beaches. For example, rather than a pastel turquoise, select a deep hue turquoise. But do try to continue the same color in multiple rooms. Visually, this carries a feeling of an open spaciousness. White is an excellent contrast to the deep colors and a respite from it. 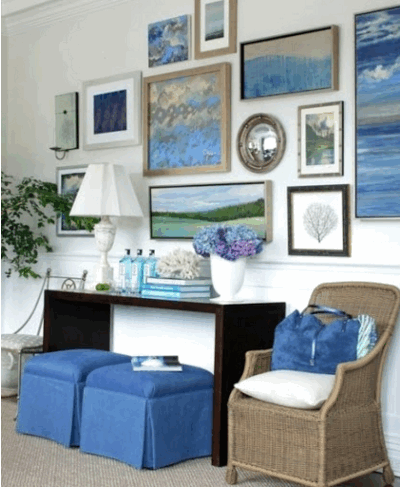 Introduce accessories with beach themes, such as framed pictures and coral motifs. Please don't beat me up for lumping these two areas together! With the exception of finding (Google research) information on Northern California decor, I discovered that the other two areas share similar styles. I won't be hurt if you can correct me if you know what are the decorating distinctions between southern (eastern) coastal decor and southern California decor. I'd love to learn the differences! Anyway, here, I must quote from an artice on How To Decorate With A Southern Coastal Theme. Select colors in the natural hues found in sand, sea oats and driftwood. Use light weighted fabrics such as cotton, linen and muslim or a blend of these fabrics. Apply it for window treatments to get that casual breezy feel. Loose slip covers on sofas and chairs invite comfort and carefree thoughts. Bring in texture like a nubie linen or muslim. Whether or not you have hardwood flooring, a mark for southern coastal decor, add an area or just a small rug for whatever serves as your cocktail table. For accessories, you don't need to go heavy on the seashell and native bird (such seabirds) collections. Add a few to a tray, a table top or as a photo or painting collection on a wall gallery. Other accessories can include arrangements of whispy dried grasses, wood candlesticks and softly-worn looking throw pillows. 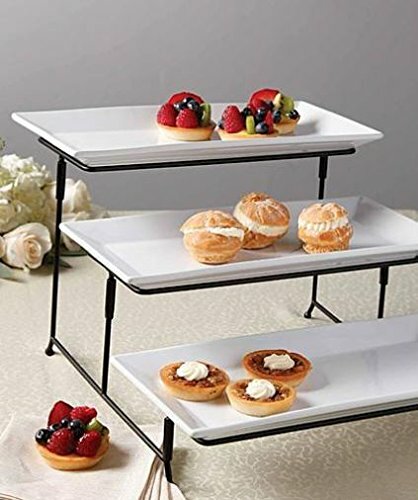 If you want a little more elegance or a contemporary classic to this very casual and carefree lifestyle, add modern cane furnishings (see Architectural Digest article We're Seeing Cane Furniture Everywhere-again), glass accessory objects and tables. Or look for that very special piece, your focal point, that you poured a lot of money into, like an elegant crystal chandelier, an oversized painting that makes you smile or a chaise lounge. 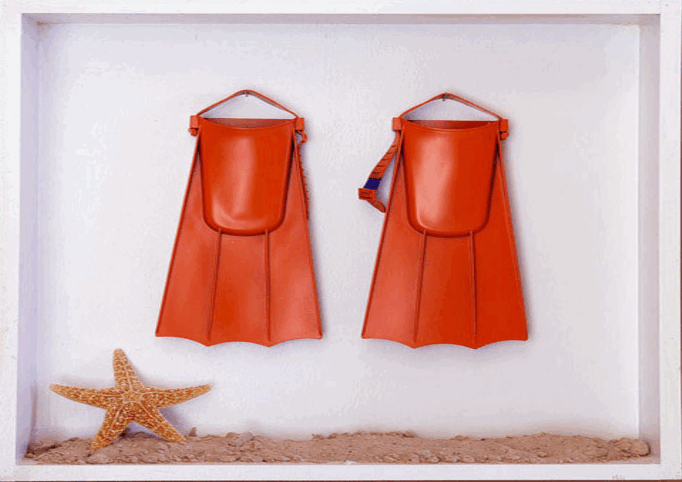 Finally, Be Sure To Have Fun Displaying Your Beach Theme Accessories! 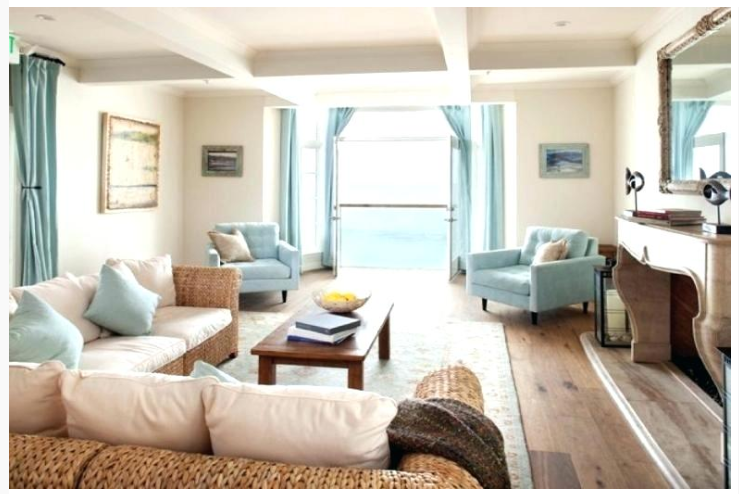 Each coastal area reflects its own decor based on the climate and the lifestyle of the people who live there. Yet, each do share some common elements found in all of them. Some of those distinctions are listed above but here I summarize their shared coastal decor elements. 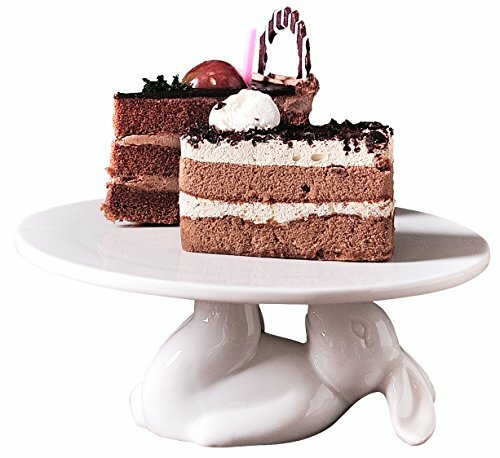 Express your design style: minimalist, traditional (scaled down for comfort), eclectic, etc. in the pieces of furniture you choose. For example, if you love the minimalist look, choose one large fitted upholstered sofa and a club chair but in the colors of and fabric that reflect coastal living. West coast, east coast, southern coast--no matter, select one or more large plant indigenous to the area, perhaps even more. Then, if you like fill in with plants found anywhere. A beautiful staghorn fern is not indigenous to the northern east coast but a northern maidenhair fern is. What Do You Think Of Lean-Against-The-Wall Mirrors?